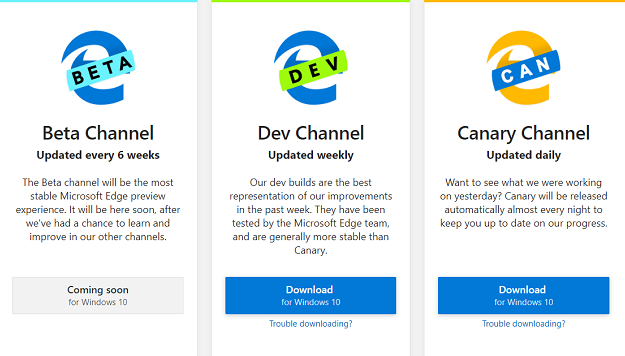 The Edge team said in its blog entry posted today that the new builds are available in two experimental release channels: Canary and Dev. Neither of those channels is guaranteed to be stable, though—they’re not even labeled “beta”, and an actual beta version doesn’t have a street date yet. The good news for Edge users is that these early releases can be run side-by-side with the shipping version of Edge for easy testing. The Canary channel, much like Chrome’schannel of the same name, consists of nightly builds that have passed automated testing. Anything that makes it into the Canary channel will have new features, bug fixes, and potentially new bugs. Qualified builds that make it into the Dev channel will be released weekly. These are aimed at web developers who need to validate newly-supported features on their web applications. Microsoft also took some time to brag about Edge’s accessibility features. The company claims that Edge is the only browser to get a perfect score on the HTML5Accessibilitybrowser benchmark. Fortuantely, Microsoft isn’t keeping its secrets all to itself, and the Edge team says it’s going to send several enhancements back upstream to the Chromium project. That’s potentially great news for folks who rely on assistive devices to use the Internet. Users can also expect better integration with Microsoft services, support for encrypted media extensions, and Windows Hello support. Interested gerbils with PCs running Windows 10 can download one of thepreview buildsfrom Microsoft. Anybody who finds a bug in these new versions of Edge is welcome to submit a bug report to Microsoft’sissue tracker.